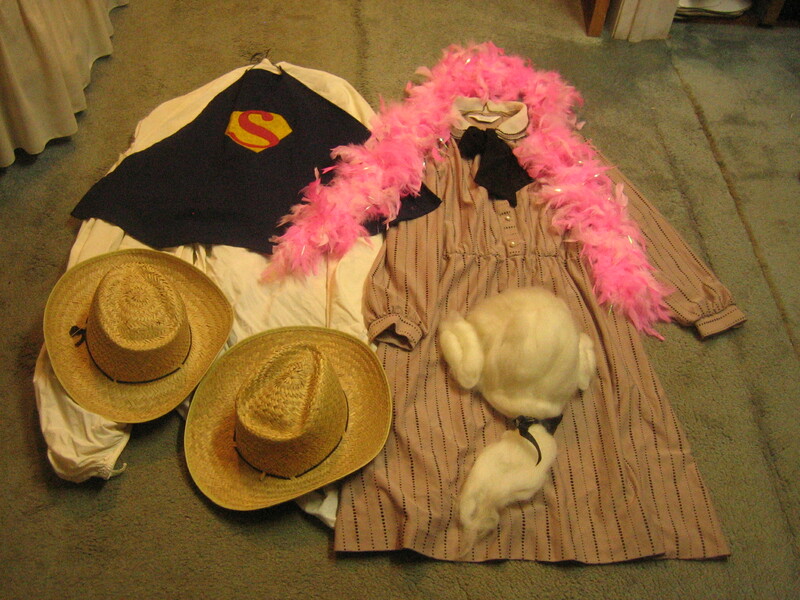 Since it’s Halloween, I’m taking a break from giving away my kids regular clothes and rummaged through our old “costume box” to see if I really needed to save all the stuff for a grandchild who doesn’t live in town or for gag costumes for special events. I decided the ghost costume made out of an old sheet was an easy thing to let go of. So were the two cowboy hats since we had two other similar ones. The Beethoven wig was pretty shabby. The boa could be useful but it was cheap to begin with and was starting to shed. I doubt if I’d be willing to risk the vacuuming job that would follow wearing it, even for fun. The old lady’s dress was a hold over from when Jim dressed up as “The Church Lady” for a skit. I decided that maybe we didn’t need a special dress for this anymore since during last weekend’s door to door campaigning, a young boy answered the door and yelled up to his mom that “An old lady is at the door!” Boy was that deflating. 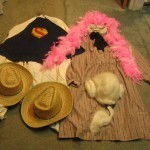 Ah, but I did find one thing that I’m happy to give away – the home made superman cape. It is with joy that I will send it to our three year old Korean godchild who is really into superheroes right now. His birthday is coming up and this will be perfect. It feels especially good when I can find the appropriate person to give something to.